Everyone in New England hears about the amazing phenomenon that is the Boston Marathon. I never personally knew anyone that ran the race but would hear about friends cheering on sisters, fathers, or cousins down in Boston. Even without a close connection, hearing about the horrific events during the 2013 Boston Marathon was heart breaking. The “Boston Bombing” as it is now known, is one of those events that will always stick with me. (I remember my high school baseball team was travelling to a game. Everyone found out individually on their phones and sat on the bus truly in disbelief). It was a horrific and unimaginable few days for everyone involved in the race, but the city of Boston quickly showed its true colors. The sports teams, the hospitals that treated the victims and the marathon runners responded to the tragedy by coming back with a “Boston Strong” attitude and showed that nothing can stop this city. 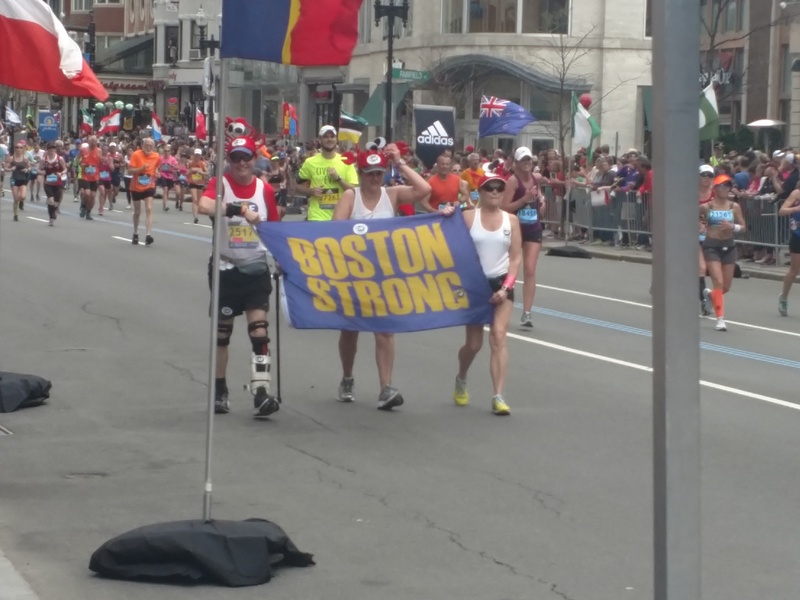 And they keep coming back making the Boston Marathon an even stronger event year after year. From that point on, I knew this was something I needed to experience in person. In 2015, I watched about an hour of the race and saw some of the second wave runners cross the finish line. It was cool to see, but I knew there was more. With Athletes Roll starting up officially in May, 2016, which introduced me fully to adaptive sports, the 2017 Marathon was the perfect time to go all-in and experience the amazing feats of adaptive and able-bodied competition here in Boston. There was some controversy leading up to the race in with many competitors confused as to why handcyclists do not receive the same treatment as the runners and wheelchair Racers receive. In the past, there were no flowers for the winners and no national anthem is played in celebration. Patrick Downes, a Boston Marathon Bombing survivor and handcyclist, spoke out about this before the race in hopes things would improve for 2017 (which they did this year). Many people backed Downes as it would bring more equality to an adaptive sports event, but others pushed back stating that the handcycles are more like bikes than they are like the racing wheelchairs. Notably, Women’s wheelchair racer, Amanda McGrory, responded on her website, stating that because of the similarities handcycling should be the responsibility of cycling events rather than marathons. Despite the early controversy, the 2017 Boston Marathon turned in to an amazing sporting event. With over 30,000 entrants and hundreds of thousands of fans it was sure to be an exciting event. A surprising advantage of the craziness of the Boston Marathon was that people planned so far ahead and showed up so early to get good views of their friends running the race that they were there to watch the adaptive athletes too. I stood in the crowd with one woman who arrived at 8:45 am at the finish line to cheer on her daughter who wouldn’t cross until 3:30 pm. 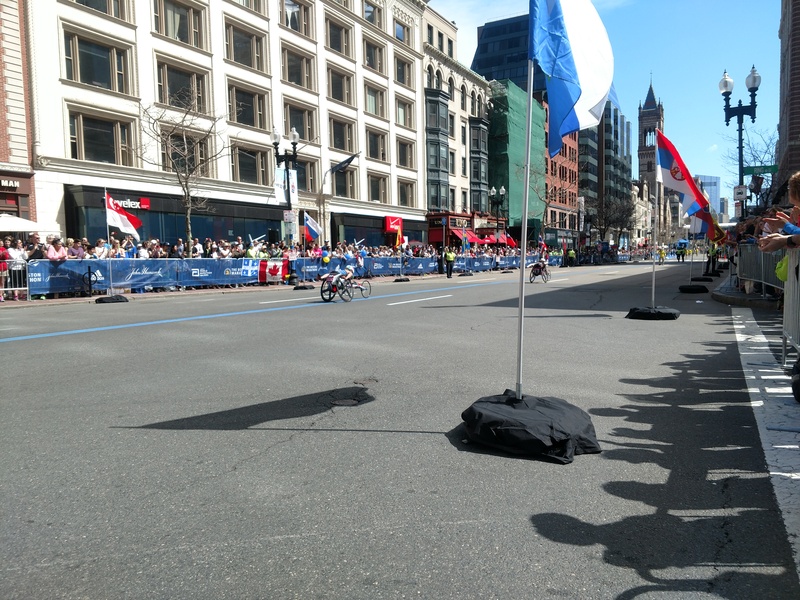 There isn’t usually much fanfare for adaptive sports events, but this way there was a roar in the crowd no matter who crossed the line (runners, wheelchair racers, policemen …the people fixing the flags on the side of the course…anyone!!). The first to come through the line was Tom Davis finishing first in the handcycle division with a lightning-fast time of 58 minutes and 36 seconds. He was followed closely by Alfredo De Los Santos (1:03:05) and Kyrs Zybowski (1:05:23). There were 28 finishers recorded in the handcycle program with many finishing the 26.2 mile course in under two hours. 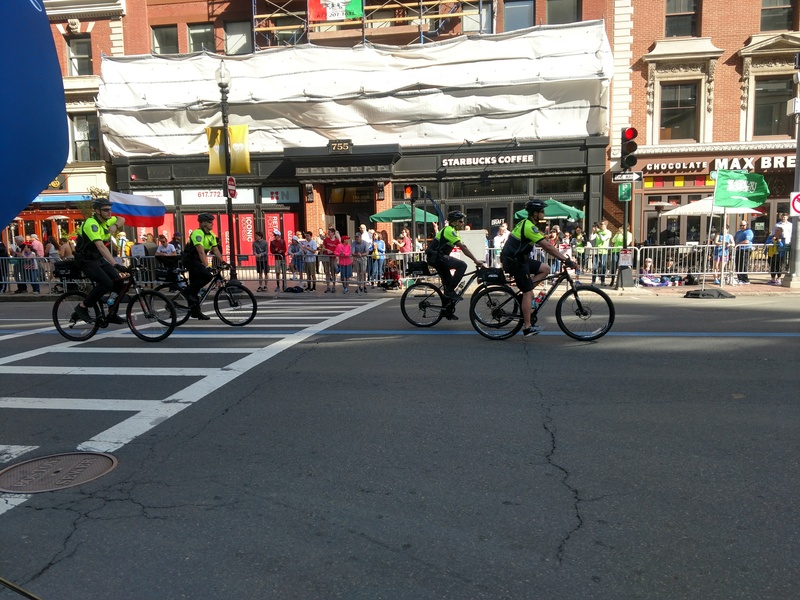 It was the first excitement for the thousands of fans lining Boylston Street and they cheered each and every time. Next up were the push-rim wheelchair racers. Earlier in the day, I started to make use of the BAA’s Boston Marathon app which tracked all of the runners and the wheelchair racers. The Men’s division took off first. Following in the app, we could tell it was a close race right from the beginning. South Africa’s Ernst Van Dyk and Switzerland’s Marcel Hug hit the first 5 kilometer split at the same time of 6:48. Then they recorded the same split time at 10km, 15km, 20 km, 13.1 miles (halfway), 30 km, and 40 km with Hiroki Nishida joining them at the 15 km mark. The only noticable separation between Hug and Van Dyk was a one second lead by Van Dyk at 25 km. As Van Dyk and Hug continued to cross split after split we knew it would be a photo finish. Marcel Hug “The Swiss Silver Bullet” ended up edging out Ernst Van Dyk by less than a second. They both finished with times of 1:18:04 which gave Hug a new Boston Marathon record beating the previous time of 1:18:25. 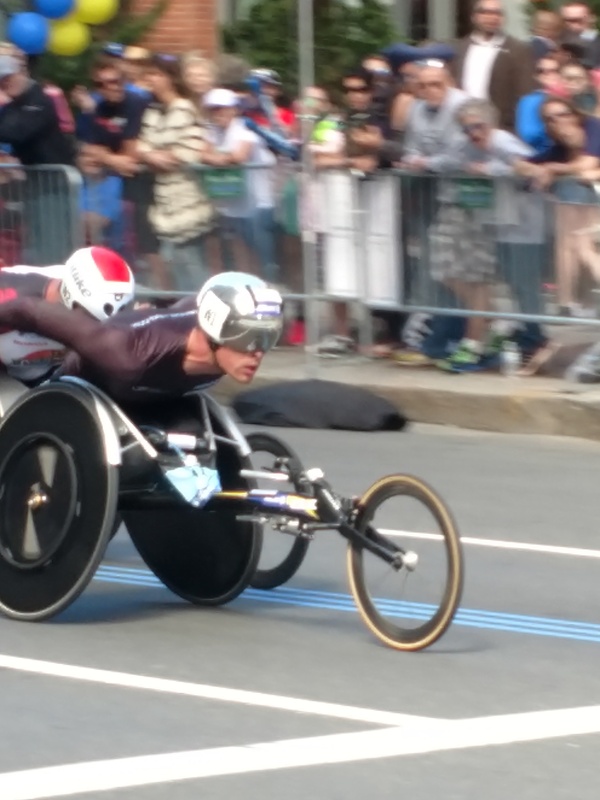 The rest of the top competitors all raced by within minutes of eachother with 38 men in total pushing everything they had into their wheelchairs down Boylston Street. The Women’s Push-rim Wheelchair racers took off only two minutes after the Men’s racers so the top women came through quickly after the first wave of men. Tatyana McFadden was the reigning champion with victories from 2013 to 2016 (and had also won the last four New York London Marathons!) McFadden was the favorite before the race, but was unfortunately recovering from a hospital stay only two weeks prior. Switzerland’s Manuela Schar took an 18 second lead after the first 5 km split and only extended it throughout the race. Schar was challenged mainly by USA competitors in Susannah Scaroni, Amanda McGrory, and McFadden. While Schar took off with the race, finishing with a time of 1:28:17, the excitement came out in the fight for second place. McGrory and Scaroni kept it close throughout with McGrory leading by under a minute for most of the first 30 km. Scaroni passed her for the 35 km split leading by one second, but McGrory finished strong and passed her former University of Illinois teammate in the last stretch to secure second place. As the adaptive racers kept streaming in, more and more fans lined the sides of Boylston Street to welcome in the first runners. The leading women’s runners finished just before noon with the men just minutes behind. Although the bulk of the adaptive racers had already finished, I stayed knowing the rest of the race would be just as awesome! excellent post! you were in a great spot to get those pictures! Thanks so much!! It was a perfect spot!